Ralph Macchio and Pat Morita waxing lyrical in John G Avildsen's The Karate Kid (USA, 1984). 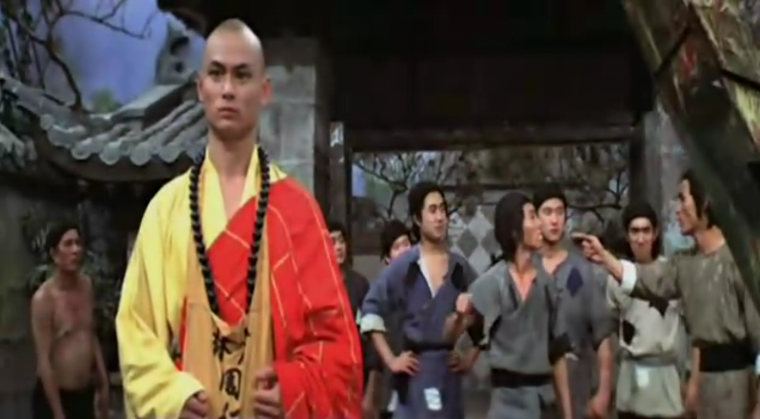 One of the central themes that this blog will set out to explore is the question of work in kung fu cinema. At least, let's call it work for now, though the word stands at the heart of a complex of related terms, ranging from labour to effort, for example, and from toil to craft. Quite precisely the best term for that to which I am referring will have to be a subject for further investigation. Indeed, in order to show how this thing I am (for now) calling 'work' is so very much at the heart of the martial arts film, and in order to begin to develop a closer investigation of quite how I would inflect this term, I propose a translation of kung fu itself as work (or, even, labour). If this seems a slightly wilful translation of the Chinese term gongfu (which is the pinyin spelling of the word rendered more commonly into English as 'kung fu'), the distortion is less shocking than it may at first appear to the untutored English ear, used as we are to understanding the word as simply the name for a Chinese style of fighting. The first thing to say, of course, is that gongfu in its proper sense does not strictly speaking refer to martial arts: the Mandarin term for martial art is in fact wushu (wu=martial, shu=art). In contrast, before being taken up as a buzzword in the martial-arts movie craze, gongfu really simply meant any kind of a high level of skill or attainment: artistry, if you like. Thus one can have gongfu in a martial art, but also in cooking, painting, making tea, metalwork, arranging flowers, baking, firing ceramics, calligraphy, etc., etc. Any forcing in my definition, I feel, is in any case validated by the fact that 'kung fu' is now not simply a Chinese term: torn from its 'original' linguistic use, it is now part of the vocabulary of a global popular-cultural phenomenon, and I am primarily concerned with this, modern, transnational word, transformed by its relation to and meaning within a cinematic genre. The measure of the translation would thus be in what it clarifies about this global cultural phenomenon – and in how we might use it to understand something about the reality from which it springs. Whatever gongfu may have meant in the past, this meaning, having work at its heart, will have been transformed by the transformation of the nature and experience of labour itself by capitalism and by globalised, (post-)colonial relations. Of course, to establish that what I propose here is a valid approach to kung fu cinema will involve looking in more detail at a set of examples, and demonstrating that work indeed is an important theme within the films (or at least one that illuminates them in a significant way). I will also have to show a link between the "kung fu" (i.e. martial arts) which forms the thematic core of the films, and to which the genre name "kung fu" refers and the representations of labour or work that the films develop. This task is, obviously, beyond the scope of a single blog post, but to indicate a direction, I'll finish this with a few pointers to where I'm heading. The sub-genre which most clearly brings work to the fore of the genre is the 'training film', where a significant part of the film will be dedicated to depicting the hero straining to develop his skill, strength and flexibility through a montage of gruelling exercises. There are many of these films – the Jackie Chan vehicle Drunken Master, for example, or Lau Kar-Leung's 36th Chamber of Shaolin and its sequels – and I shall have to come back to enumerate more about these at a later point. Perhaps the film most familiar to the Western audience is John G. Avildsen's American revamp of the kung-fu flick, The Karate Kid (1984). Here the theme of training and the nature of work are picked up from the narrative pattern drawn from the Hong Kong originals it copies (perhaps in particular from Return to the 36th Chamber, of which I will certainly have more to say in this blog at a later date...). 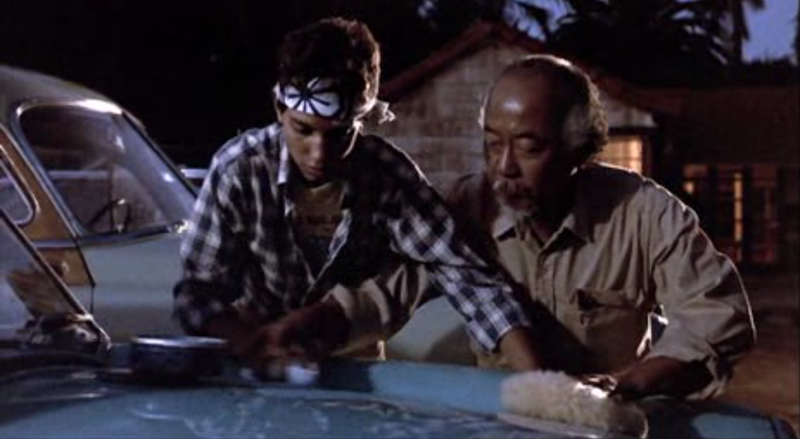 In Karate Kid, then, 'Daniel-San' is taken on by teacher Mr. Miyagi, who, it seems, rather than teaching the punches and kicks his student expects to learn, sets him off to work on back-breaking menial tasks around his home – famously waxing cars, sanding decking, and painting both fence and house. Daniel despairs that he has learned nothing and just been conned into doing unwanted tasks, but, of course, it turns out that in these tasks he has been training his arms in the precise mechanics of a sequence of blocks and strikes, along with the strength and stamina to perform them effectively and repeatedly. Of course, what is at stake here in Daniel's acquisition of 'kung fu' is the line between alienated and unalienated labour: the work which consumes the worker's life draining the energies and resources of his or her body, and whose value accrues to a boss, set against the work which reproduces life and whose whose fruits return to the worker. Daniel's investment in the work of training accrues not only, or not centrally, to Mr. Miyagi, but to Daniel himself, who gains from his toil an enhancement of power, energy, wisdom and ability.